“Since April, we are moving beyond 2020 and 2021 to go to the new mobility side with driverless. That's where our research is going,” said Maarten Sierhuis, director of Nissan's Silicon Valley center. TOKYO -- The Renault-Nissan alliance is going on the offensive in Silicon Valley with plans to expand operations there, integrate new partner Mitsubishi and step up work on self-driving cars. The joint r&d center's latest project, a prototype vehicle for autonomous city driving that can navigate intersections, was delivered to Nissan's tech center for further work in Japan in April. 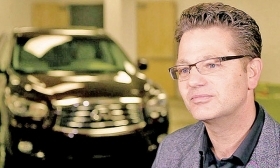 The California outpost has since moved on to working toward autonomous vehicles as part of the alliance's plan to deliver self-driving cars by 2022 and become an operator of autonomous ride-hailing services, said Maarten Sierhuis, director of Nissan's Silicon Valley center. "We can't wait too long," Sierhuis said in an interview last month. "Our focus is really city driving. And since April, we are moving on to beyond 2020 and 2021 to go to the new mobility side with driverless. That's where our research is going." Part of the ramp-up will entail an expansion of the r&d center's resources within the next year, Sierhuis said. He declined to say what the build-out would entail in terms of additional employees or areas of research. The center opened in 2013 and has about 70 workers today — 17 from Renault, the rest from Nissan. Mitsubishi, which came into the alliance last year when Nissan took a controlling 34 percent stake in the company, is not part of the operations yet. Takao Asami, the alliance global vice president for research and advanced engineering, said the group will soon begin integrating Mitsubishi into the network. The Silicon Valley center has a seven-vehicle fleet for testing on local roads: three Nissan Leaf electric vehicles, two Infiniti Q50 sedans and two Renault Zoe EVs. Although the site was established in 2013, it took researchers six months to develop the high-definition digital maps needed to navigate the area's streets. Road testing started in 2014. In the thousands of miles logged since, the cars have had no accidents, Sierhuis said. Research will increasingly focus on the software side of autonomous driving, he said. "The future of mobility is in mobility services," Sierhuis said. "That includes artificial intelligence and technology in the cloud. That is a very important part of the strategy." Nissan's latest autonomous prototype technology, deployed in an Infiniti Q50, uses 12 cameras, nine radar sensors, six laser scanners and 12 sonar sensors to capture a 360-degree view around the car, the company says. AI analyzes the surroundings. The system delivers door-to-door autonomous navigation, Nissan says. The driver sets the destination at home, and the car does the rest. It stops at red lights and goes on green. It turns at intersections. It enters toll gates. It merges into highway traffic, changes lanes and then exits the highway. Finally, it navigates city streets to its destination. Asami said it was too early to give details about the technology, such as the size of initial autonomous fleets, areas of operation and weather limitations. But Nissan promises that system will be "available for real-world use" after 2020. Said Sierhuis: "The capability improves every couple of months."